There are not many mechanical watches for women costing less than €3,000. Many brands are convinced that most women prefer a quartz watch so that it keeps going autonomously for a couple of years before having to change the battery. Here are some watches for those women who like the idea of a self-winding mechanical watch. They are listed in order of price, starting with the most affordable. Mondia watches is an Italian brand whose range includes some automatic watches with movements by Japanese company Miyota. 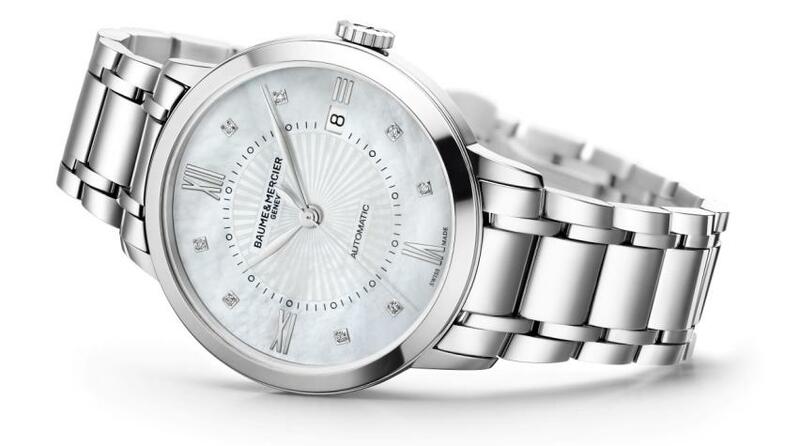 An example of one of their women’s watches is the Madison automatic watch 9230, reference 1-693-2, with a Swiss ETA movement in a 32 mm case, and a steel bracelet with a combination of gloss and satin links. It is quite a chunky piece, solid, with sapphire caseback. 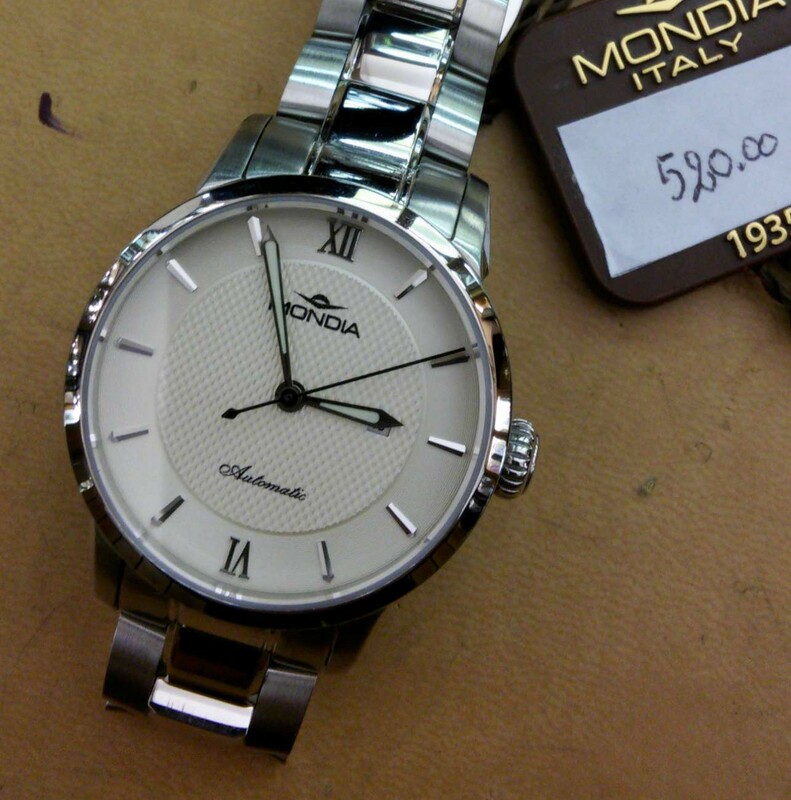 The watches are distributed in Italy: for details see http://www.mondiawatchgroup.com/. Price €520. Read more here. Back in 1934, the first model of this watch was inspired by Harbour Bridge in Sydney which had been completed two years before. Eighty-one years on, the collection is still going strong. The latest women’s model has a mother-of-pearl dial with vertical strips that evoke the suspension cables of the bridge, and touches of PVD rose gold finish on the hands and hour markers. The 31 mm polished 316L stainless steel case has a water resistance of 100 metres and protects the self-winding movement, which can be viewed through the sapphire display caseback. The movement is the ETA 2671, providing 38 hours power reserve. The watch is fitted with a polished metal bracelet with déployant clasp. 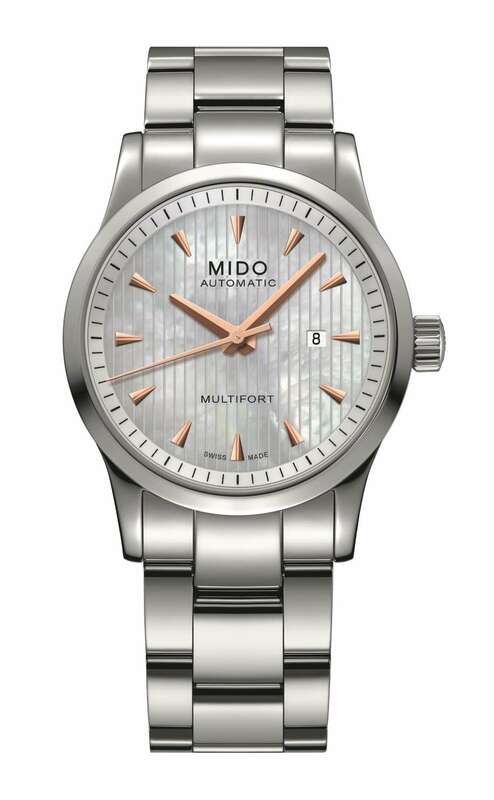 The Mido Multifort Lady Mother-of-Pearl is reference M005.007.11.101.00, and its price is approximately €846. It is also available in a version with pink gold-PVD finish and black leather strap. Read more here. Mido‘s Baroncelli collection offers women’s watches with mechanical movements at accessible prices, and this piece in particular is powered by the new ETA Caliber 80 which – according to the brand – provides 80 hours power reserve. The dial is in white mother-of-pearl dial with eight diamond hour markers (total 0.04 carats), framed by a circular rose PVD-finish 316L stainless steel case mounted on a cream-coloured leather strap which has a rose PVD-finish folding clasp. The result is a classic 33 mm women’s watch good for the day and through to the evening. Water-resistance is 50 metres. The watch has a sapphire caseback providing a view of the self-winding Mido Caliber 80 movement, which is the ETA C07.611. 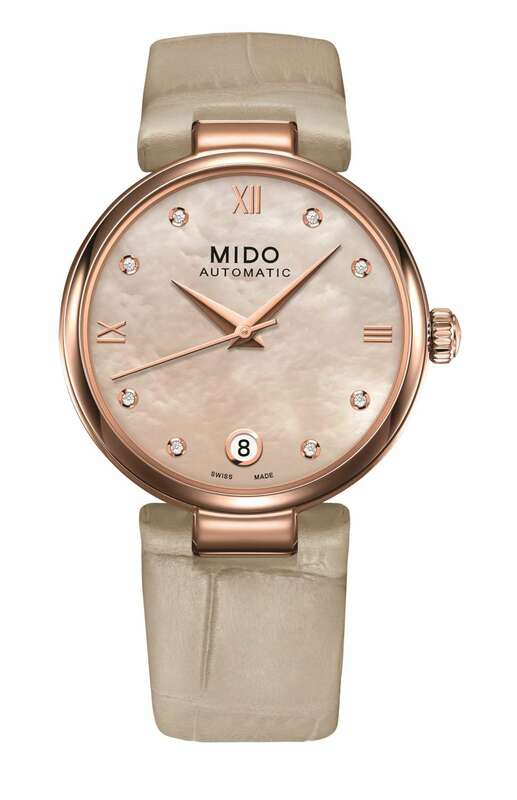 It is decorated with circular graining, blued screws and an oscillating weight with Côtes de Genève and the Mido logo. 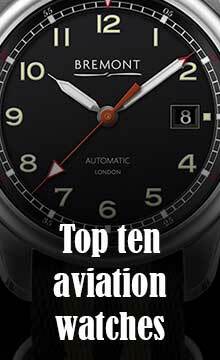 The 80-hour power reserve is attained in part by a reduction in frequency from 28,800 vph to 21,600 vph (3 Hertz), a reduction in the barrel pinion diameter in order to increase the size of the Nivaflex NM mainspring, and high-tech materials used for the escapement in order to decrease friction. The balance regulation system has also changed: there is no longer the conventional regulator index, and instead of acting on the balance spring (now called the Elinchron II balance spring), the system seems to be based on adjusting the geometry of the balance wheel (inertial regulation). This is performed by laser in the factory. The Powermatic 80 movement is used in many entry-level watches by Swatch Group companies Tissot and Certina, and we are likely to see many more mechanical watches for both men and women with this calibre. The only doubts about this piece of engineering are whether the movement contains parts – the pallet fork and wheel – in some sort of plastic, and whether the watch can be serviced (as opposed to the Swatch Sistem 51 whose calibre is sealed and inaccessible for service, making it a watch that will eventually be thrown away). The Mido Baroncelli Donna Caliber 80 is reference M022.207.36.116.11, price approximately €980. Read more here. Jeanrichard has introduced its Terrascope in a 39-mm version, with display caseback revealing the movement with its black oscillating weight. 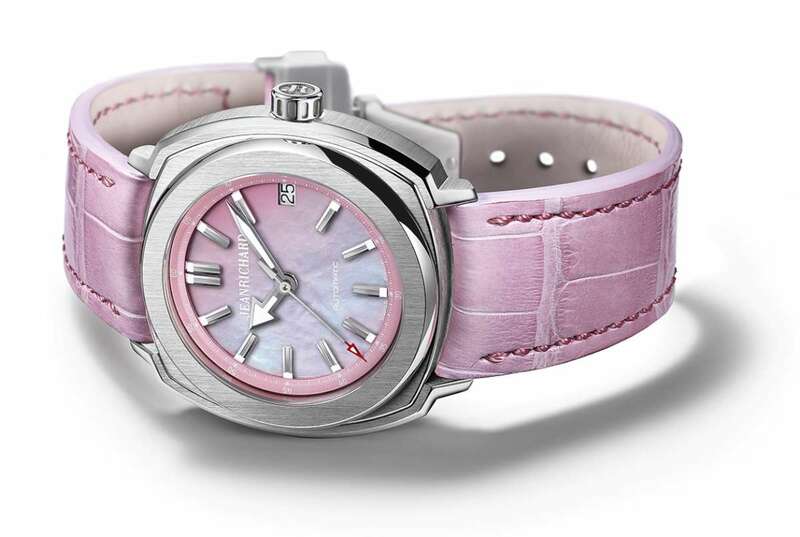 In the new series, four watches are aimed specifically at women, amongst which this model with steel case, pink mother-of-pearl dial and pink alligator strap. It is powered by the JR60 movement, which is probably not an in-house calibre. It runs at 28,800 vibrations per hour, 4 Hertz, with 38 hours power reserve. The cushion-shaped case is 39 mm in diameter and 10.3 mm thick. The reference of this piece is 60510-11-901-BB9A, price €2,400. Read more here. Baume & Mercier are about affordable luxury, and their Classima range of watches, originally launched in 2004 and a pillar of the brand, has been completely redesigned to create more contemporary pieces, celebrating the brand’s 185th anniversary this year (Baume & Mercier was founded in 1830). 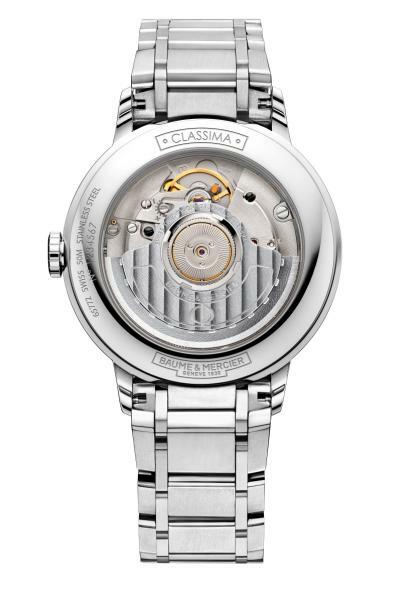 Classima was originally for men only, but this year, reflecting the general trend towards feminine mechanical watches, it is available in models for women as well. The women’s versions at 36.5 mm are large enough to enclose automatic movements. The basic concept of Classima is that of the entry-level watch, for people aged 25-40, the classic watch bought to mark a special occasion and that could become the first of a series. In the women’s versions, the guilloché at the centre of the dial is in sunray format, while the dial itself is white or mother-of-pearl, with Roman numerals and diamond-set indices. The movement is the automatic ETA 2892 with personalized oscillating weight, and 42 hours power reserve. The watch is 36.5 mm in diameter and 7.95 mm thick. Price about €2,700. Read more here.